Does Your Company Have the Right Digital Marketing Capabilities to Prosper in 2014? The planning process for the start of each new calendar or financial year is an ideal time to take a high-level view of how effective your digital marketing really is. It’s essential when reviewing what digital marketing is delivering from week-to-week or month-to-month that you analyse the returns from different digital channels in detail, as we often describe in the ClickThrough blog. But taking a helicopter view of the overall effectiveness of your digital marketing and resourcing is useful too, at least once a year. Since the high-level capabilities will determine whether you can implement best practices and optimise your digital marketing. For businesses to deliver on the commercial potential of digital channels depends on whether they have the right capabilities in place across the company for all the digital customer touchpoints that need to be managed. Integration between marketing and sales teams and selecting the right agency resources are a key part of this too. In a new report Managing Digital Marketing in 2014 in collaboration with the TFM&A conference, I recommended that companies perform a top-level analysis, reviewing their digital capabilities from basic to advanced. The results in the 720 companies surveyed showed a wide range in capabilities. 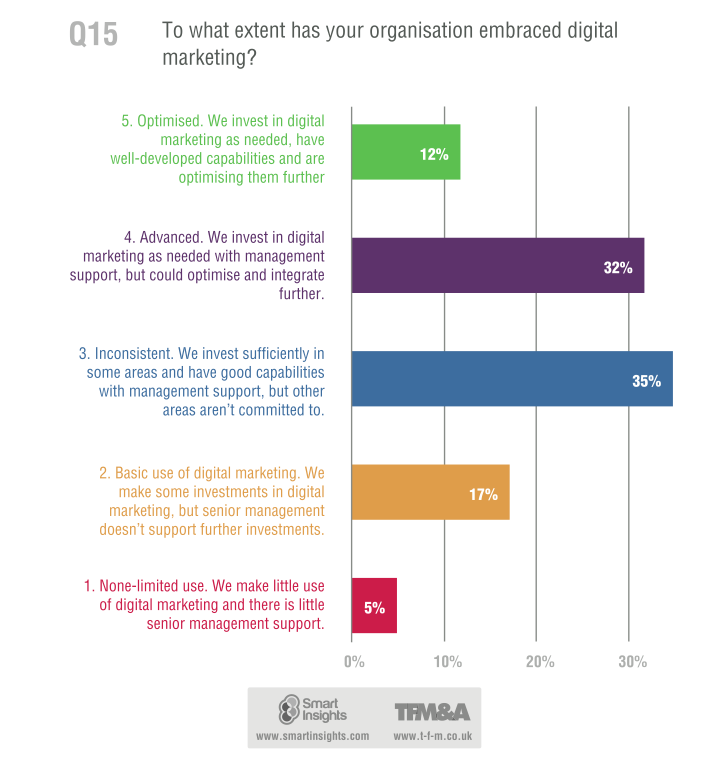 It’s encouraging for companies making the transformation to digital marketing that over one third have achieved this and rated their digital capabilities as 'advanced' or 'optimised'. However, these may be your competition - and over half rate their capabilities as only 'basic' or 'inconsistent'! Reviewing your capabilities for digital marketing has the benefit that you can use it to communicate to non marketing colleagues how far you have progressed in adapting your organisation to digital marketing. You can also show where you are compared to other organisations and more importantly explain where you need to make improvements to make the most of digital marketing. Which Capabilities Should You Review? Strategy: The definition of key approaches for an organisation to achieve its goals. Structure: The organisation of resources within a company into different business groups and teams. Style: The culture of the organisation in terms of leadership and interactions between staff and other stakeholders. Staff: The type of employees, remuneration packages and how they are attracted and retained. Skills: Capabilities to complete different activities. Systems: Business processes and the technical platforms used to support operations. Shared Values: Summarised in a vision and/or mission, this is how the organisation defines it’s raison d’etre. All businesses are looking to improve their digital marketing, but it’s not just a case of trying the latest tools, rather it’s a transformation to new ways of working, new resources and new structures. The 7S provide a great framework for this. All the best for improving your digital capabilities in 2014!